I went with the optional one layer twist using my 3 fav Spring colours-green, orange and yellow!! I wish I had got a better photo of this as it doesn't show off how bight and 'Spring' like it is IRL! But it is in the post now and when I took the photo the London sun was hard to find!! Our sponsor for this challenge is Uniko. Here I have used their stamp set Originally Organic. I simply stamped it slightly off the edge and coloured a few buds in yellow adding my enamel dots to finish. And just the perfect sentiment to Spring and our Friends! 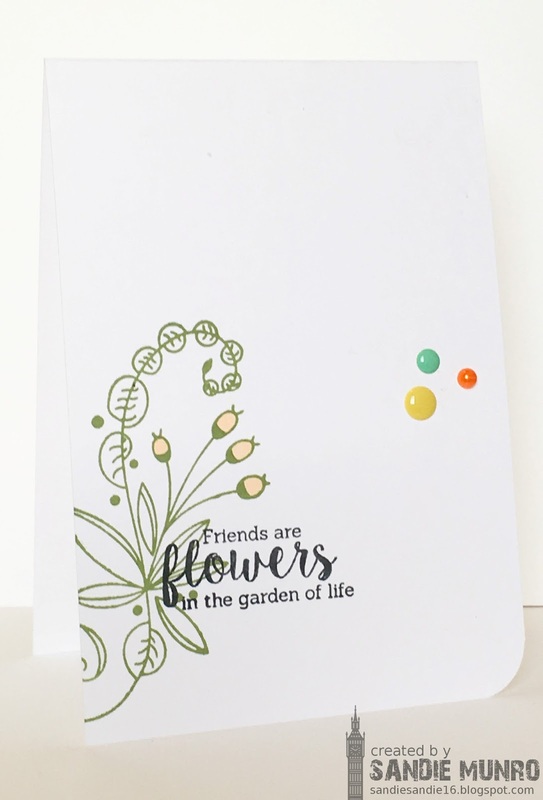 Our Guest Designer for this challenge is Kimberly. I am sure many of you know how amazingly talented Kimberly is-check out her blog Wienerhoneymooners. and you will see what I mean. We are delighted to have you join us Kimberly. Pop back over to Time Out to check what Kimberly and the DT have made to inspire you. Fabulous card, Sandie. It would be nice if the sun was around! Excellent spring mood and lovely card!